Bring the whole tithe into the storehouse that there may be food in my house. Test me in this” says the Lord Almighty “and see if I will not throw open the floodgates of heaven and pour out so much blessing that you will not have room enough for it. Earlier this week I sent an email out to the FBC church family. In it, I encouraged our people to do five things throughout October that involve the number ten. I am convinced that corporate commitment to these things, even over such a limited time, can be so spiritually impactful to us individually and collectively. I am crazy enough to believe that God honors intentional acts of faith from his children and that the very act of doing these things can set lives and churches on a new trajectory. Four of the five challenges will cost you no more than your time, your presence, attention, and simple Christ-like responses to others. 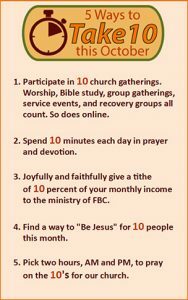 But the one in the middle calls for a specific action – to joyfully and faithfully give a tithe of ten percent of your monthly income to the ministry of FBC. To someone looking in from the outside or a new believer, this may sound like an excessive, even unreasonable ask. To longtime veterans of the faith, it simply reflects the biblical admonition that we have accepted and adhered to for years. For some, the tithe is a starting point for generous stewardship while others question whether the practice is attainable or desirable to them. I assure you that, for the believer, it is truly both. I have looked back over our giving for the past decade plus and discovered this. Since well before the great recession, FBC has never received as much as $100,000 in a four-Sunday October. I am challenging our people to make 2018 the year that shows we can! If you are a tither (a ten percent or more giver), keep on, and as God leads, reach a little deeper. I personally cannot imagine not making that my first financial priority each month. If you do not practice the tithe, now is the time to try and invite the Lord to both enable and bless you. If God has blessed you with more than you need, ask God just what he might have you do with some of that abundance. Joyful giving is an essential part of our total life of faith. As your pastor, I implore us all to, for one month, stretch ourselves in that realm. I can promise you that God, who knows our heart and our capacity, will be honored, pleased, and compelled to bless us all as we respond together. Let’s make that happen.